Need a FAST FBI Background report? Dallas Fingerprinting is a Law Enforcement trained Fingerprinting Service and certified for Federal and State fingerprinting in all 50 States and fully insured and bonded. Dallas Fingerprinting.com is committed to offering the most professional service and highest quality fingerprinting to each client - call us at 214-793-1155 for an office fingerprinting service appointment at our convenient location - 1226 N Belt Line Rd, Irving, TX 75061. If time is a factor, we’ll be happy to schedule a mobile appointment with you – we’ll come to your location to fingerprint you! When requested, we will provide proof of official certification to you prior to conducting the fingerprinting process. Our work is fully guaranteed - ACS technicians are experts and our staff has fingerprinted thousands of people with an impeccable record of providing classifiable fingerprint recordings. With a fingerprint rejection rate of less than 1%, you can see why we are the TOP RATED fingerprinting service in Dallas - Fort Worth Metroplex. We guarantee every fingerprint card we do! Dallas Fingerprinting offers the highest quality of fingerprinting work at the lowest prices in the Dallas area and we stand behind our experience and attention to detail. After each set of prints are taken, we perform a quality check to ensure your prints are recorded correctly the first time. We are known for our expert Fingerprinting and Notary services and we understand the importance of having this done correctly the FIRST time. Dallas Fingerprinting maintains an exceptionally low classification rejection rate of less than 1%. Rejections are most often due to adverse skin conditions such as medical issues (chemotherapy - eczema), washing hands excessively, dry cracking skin, cracks and lighter ridge detail due to aging, callused fingertips and injuries or amputations. Due to any of these adverse skin conditions, no fingerprint technician has a perfect record. "ACS does guarantee all fingerprinting - if for any reason your fingerprint records are returned by the authorities deemed unclassifiable due to OUR error, we will reprint you once more at no charge in our Irving office. If we printed you as a mobile service at your location, your reprint will be at no charge however, there will be a mobile trip fee equal to the original mobile fee. Fingerprint records rejected due to skin condition or the fact that your fingerprint ridge detail is worn or flawed, which prevents obtaining classifiable prints, are not our fault and reprints will be at our normal fingerprinting fee." Our pricing structure is very affordable and in line with current industry standards. Our pricing depends on several factors, if you are coming into our office by appointment or we are driving to your location - if we are meeting you at our office before normal work hours or after our business hours. For large groups or corporate pricing discounts - simply call us at 214-793-1155 or 214-733-7105 for an instant price quote. Call us first or call us last- in any event, you will get superior service and expert fingerprinting from us! We stand behind our service – We are always professional – period. Payment is expected at time of service – Dallas Fingerprinting does not invoice – Payment can be made via credit card – company check – cash. The fingerprinting process is quite simple - you must provide us with picture ID such as a driver’s license, State ID card, Military ID card, or Passport. Once we establish your identity, we will have you sign the fingerprint card as well as provide and fill out other required information on the card, we will sign and date it, and then we will fingerprint you. The entire process takes just a few minutes - we know your time is valuable, and whether you come to our office or we come to your location - we offer complete professionalism with a sense of urgency, to get you back to what you need to be doing with minimal interruption. Of course, your personal information which you provide on the fingerprint card stays with you - we do not keep any type of record of any of your information besides your name and address for your receipt. We value your business and the fact that you place your trust in us to properly record your fingerprints for you. We use black ink on the FBI FD258 fingerprint card to record your prints. Additionally, we can print on the standard State of Texas DPS fingerprint card if you need that card, we offer a special card to record your child’s fingerprints and personal information to be used by law enforcement officials if ever needed, and we can print on any State specific fingerprint card(s). With over 25 years of law enforcement experience, you can count on Dallas Fingerprinting to record your fingerprints correctly the first time! Law enforcement trained and certified to provide fingerprinting services in Dallas TX and beyond! Are you just wanting to purchase fingerprint cards? We will sell you 1 or 1000! Dallas Fingerprinting stocks the required fingerprint cards you need, including the standard FBI FD-258 Applicant fingerprint card commonly used for most types of fingerprint background checks. Of course, we would like to have your fingerprinting business, but if that’s not possible, please go to our Products Page to purchase the FBI FD258 cards or call us at 214-793-1155. Offering Top Rated Budget Priced Mobile Services! Our company is your best source for value-driven, turnkey professional Fingerprinting, Notary, and Drug Screening services. Our company is your best source for value-driven, turnkey professional Fingerprinting, Notary, and Drug Screening services. We are able to provide the most value and innovation per dollar spent by providing a satisfaction guarantee for every service provided. "Jay was SUPER easy to work with, very polite, and efficient. I arrived a bit early, as I wasn't sure how long paperwork and such would take, and he got to me right away. He was willing to answer any questions that I had, and didn't make me feel bad for not knowing. I highly recommend this place! Thanks, Jay!" "Due to service showing up early, we got started and everything went quick and easy! Very grateful for this service!" "After searching and searching and dealing with countless automated systems that resolved nothing, it was great speaking to a real person. Great service! They answered all of my MANY questions clearly. No hassle scheduling." In 29 States, Including Texas! All fingerprinting will be completed in accordance with industry standards. Fees charged for fingerprinting or notary services are for our time and labor spent meeting with you, thus we have a no refund policy. We do guarantee our fingerprinting so if your fingerprint records are returned by the authorities or FBI deemed as unclassifiable due to our error, we will reprint you once more at no charge in our Irving , TX office - If requested, we will reprint you at your location, however, a mobile trip charge will apply for time and fuel used while traveling. Rejections are most often due to adverse skin conditions such as medical issues (chemotherapy - eczema), washing hands excessively, dry cracking skin, cracks and lighter ridge detail due to aging, callused fingertips and injuries or amputations. Due to any of these adverse skin conditions, no fingerprint technician has a perfect record and a rejection due to these reasons are not the technicians fault. If your cards are rejected due to missing information, this will not be deemed “our fault”. Customer must fill out all blocks on fingerprint cards prior to sending to FBI. If your fingerprints are rejected for any reason not deemed our fault, we will charge our normal fee for re-printing you. If your fingerprints are returned due to low ridge detail or a skin condition preventing us from recording classifiable fingerprints (or other reason not deemed our fault, such as missing information on cards, etc. ), we must charge standard rates for another set of fingerprints. We maintain an extraordinarily low rejection rate. In the unlikely event that you are notified of your fingerprints being returned, simply call ahead to schedule an appointment and bring the rejection letter you received with your receipt for your reprints – MUST present receipt and rejection letter. It is your responsibility to know if you are required to obtain ink based or electronic fingerprinting for your background check prior to scheduling an appointment with us. 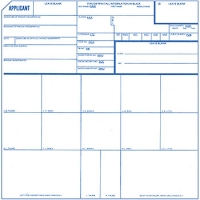 Blank FD-258 cards purchased are final sales and are non-refundable.